Just as our beautiful illustration shows the process of a caterpillar forming a cocoon and transforming into a beautiful butterfly, so goes the transformation that we are making for every child and family we serve. That is our mission. As Behavior Analysts, we know that our methods are very effective and so we have learned to “Trust the Process” in most instances. But what about those cases that are slow moving, or where there are roadblocks to success, or where you wish you could just find that secret key to unlocking the door that is keeping the child from coming into the world in a new and profound way. In those instances, it is especially important to trust the process. Of course the transformation may happen at varying degrees based on a whole host of factors. What I know about The Behavior Exchange is that each of you embody what we were founded on, and that is, that every individual is capable of greatness. Everyone is capable of learning, growing and becoming something more beautiful and improved than they were before. Sometimes we may see one child’s progress and compare it to another’s and feel discouraged. For some children, the reality is that there progress may be slower, it may be more limited, but that doesn’t mean that it is less important. In cases like this, we have to look for those behaviors that are most functional and that can provide the biggest impact for the individual and focus there. This is where the notion of the behavioral cusp is very important to understand. A behavioral cusp is a behavior that can open the door to a wide range of changes in the child’s environment. It is any behavior change that can bring the child into contact with new contingencies that have a huge impact. An example would be literally, opening a door. When a child learns to open a door, this behavior is considered a cusp because the child now can open any door and can come into contact with a whole host of contingencies based on what is behind that door. So, think about other examples of behavioral cusps and a single behavior that can have a dramatic effect on the child’s ability to access new information, environments and contingencies. These are the skills that we should focus on for all of our clients, but especially those with slow progress. 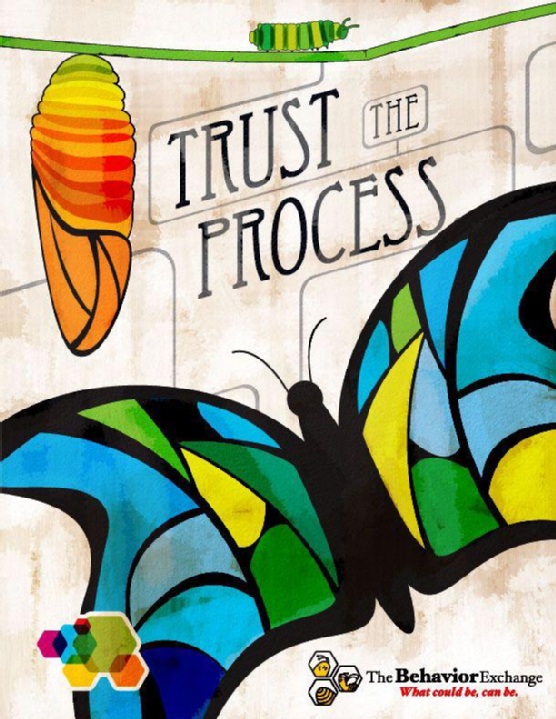 Of course, trusting the process does not only apply to our clients, but also to ourselves. Aren’t we all striving to be better all the time? Personally, professionally….a better friend, a better wife, a better husband, a better parent, a better child or sibling, a better neighbor, a better student, a better co-worker, a better citizen….to stop smoking, to start exercising, to lose weight, to eat better, to study more, to do nice things for people, to find a new hobby, to visit a grandparent more….everyone is trying to improve. I remember my mentor telling me so many times…..”Be Patient”. It sometimes drove me crazy hearing that. I wanted results now. I wanted to be better right away. But, I hear his wisdom echoing in my ear a lot now…..Be patient. And, I believe that’s what I want to focus on this week. Be patient. Trust the process. For our clients….for you…in each other…and for The Behavior Exchange as a whole. We need to trust the process of crawling along dilligently as a caterpillar to wrapping up ourselves in a cocoon and being still and reflective to gather the strength for the growth ahead, so that we too can all see the hard work transform into a beautiful reality that we can all celebrate. Each day we make these transformations possible. Each day all of us and our clients are in various stages of this transformation process. So, let’s trust the process and be sure to celebrate the butterflies as they fly by, knowing that we have made a difference.